Easier method for zeroing red dot and pistol sights better than my home made attempts anyway. Good solid rest and cheap too. 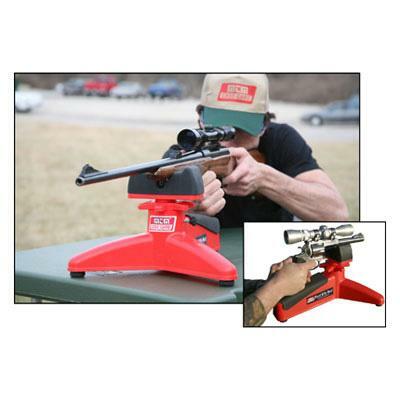 A great and very rugged rifle rest very light too. I have tried it with both my rifles and I cannot fault it. Although delivered in kitform this shouldnt be a problem for anyone to put together. Well worth the money and I would not hesitate to recommend it to anyone looking for a good quality gun rest. Absolutely delighted with the gun rest and the other items I purchased, communications and next day delivery brilliant. I will be using Uttings again when the buffalo camo gun bag is back in stock. Great product at a great price. Rest comes in a few parts for simple self-assembly, all the parts are of a good quality and plastic mouldings are robust. The screw height adjustment gives a good range and I found it easy to get a comfortable position. Once the adjusting screw is clamped using a small thumbscrew on the side the rest is rock solid. They have got the grade of rubber used for the feet and stock rest just right, soft enough to give a sold grip but hard enough for good support. The stock rest has no rotational movement but I found it wide enough and of the right shape to provide sufficient support and side to side movement for aiming. I have found this front rest is just right for target shooting with sufficient freedom for aiming and sufficient support to hold the aim during firing. It seems to me that the rest has been designed by someone who shoots and knows what is needed from a rest.